This simple and quick pattern was created as part of the #PussyHatProject. This project was started by a group of women who decided to wear pink, cat ears hats during the March for Women’s Rights and Social Justice. This project has quickly grown and is spreading across the country. Crochet holiday wreath photo frame ornament. Quick and easy crochet project for the holiday season. Makes a great last minute gift, stocking stuffer or place card holder for Christmas dinner. Panda pen or pencil cozy. Will fit most pens without the cap and pencils. Great back to school project. Holiday Hat 3 Pattern Pack! Santa, Reindeer & Grinch Hat! Three crochet holiday hat patterns for one low price! Perfect for the holiday season! Patterns are simple and quick to make. These hats make great photo props or holiday gifts! Simple, two tone ballet slipper pattern. Instructions to fit U.S. women’s sizes 5-12. Easily customizable. Super simple and quick credit card holder cozy. Perfect pattern for a beginner. Keeps your credit cards safe from scratches. Professionally written crochet pattern for this unique and versatile headband. Headband is comfortable enough to wear all day! Cute Mickey Mouse inspired spare toilet roll cover and tissue box cover. Both patterns are beginner level. There are photos along with written instructions for both patterns. Simple crochet pattern perfect for beginners. Finished coaster will take less than 30 minutes to complete. Adorable little Mary Jane skimmers. These little booties come with the pattern for the flower shown in the picture but also look great by themselves or can be dressed up with another applique. I wanted a fun, trendy design for an iPhone or iPod touch case. I couldn’t be happier with how this owl cozy turned out! 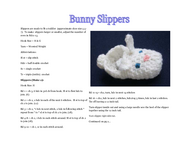 Crochet pattern for Toddler size bunny slippers. The pattern is written for a toddler with shoe size of approximate US 5.5 - 7 but can be adjusted to fit up to a toddler size US 10.